This is an incredible post from Travis. Read the post in full, then go back and check out all the links. He is a wealth of information. My name is Travis Statham and I’m a 29 year old tech worker living in New York City but born an hour away in Connecticut. I am a metal-head who loves going to live shows in the area and I like all sorts of sub-genres of death metal and the associated mosh-pits. I’ve also been doing Brazilian Jiu Jujitsu for the past 5 years at Clockwork Jiu Jitsu in Manhattan and cannot recommend the sport enough to fellow adults looking for some interesting physical activity. I rowed for 5 years from high school to college and played some soccer and ran the mile in middle school. I admit I never understood anything about nutrition until I read Good Calories, Bad Calories by Gary Taubes when I was 22 and slightly overweight after graduating college. It was a book that my mom recommended to understand low carb diets and I’m super glad I read it because it exposed layers of reality that I’m not sure many know how to cope with. I ate predominantly a meat-based ketogenic diet before going full carnivore. Interestingly, I remember hearing about it when I read Good Cal Bad Cal and thought at the time that it was too crazy to be considered useful or necessary, but over the course of the book I became convinced I could cut carbs to zero and be healthy as ever. I ate keto or a very guilty SAD diet ever since. I was one of the few doing it at work way back in 2013, finding good keto friendly meals while looking for lunch with my coworkers in Manhattan, at first to lose a bit of weight and then because I felt better on it. A lot of those meals by necessity were meat-only, but I wasn’t avoiding plants, just realized they are sometimes hard to get with lunch. I talked about it on Facebook back then and took a lot of heat and realized how big a battle I’d have to fight to do low carb for life, but I like doing the seemingly wrong things when I know I have the right reasons, so it’s been a natural thing for me to do as a rebel. That said, over the years, I’ve read more books, studied more material, and become more confident that a low carb diet is the natural human diet, but only in the past year have I truly questioned whether humans are facultative carnivores. Nequalsmany.com carnivore study group 2 is the first video I saw by Dr. Shawn Baker and I thought it was really cool that we could collect anecdotes and create hypothesis about how nutrition affects humans and outcomes. The video came out in middle September of last year and I was just finishing up The Case Against Sugar and was 100% committed to going strict keto and thought that carnivore was worth investigating. I found r/zerocarb, read a bunch about Charles Washington, The Bear’s advice and forum posts, and joined Zeroing in on Health and Principia Carnivora on Facebook. The anecdotes fascinated me and I was moved by the science saying that fiber should stay in a role where we don’t know if it’s really good for us. I gradually reduced all plant consumption from August until December as I was researching and experimenting with shorter stints and then went pretty strict Carnivore around January 1st. Personally, I approach the Carnivore diet as the best long term and the best short term diet. I don’t think there’s any reason to feel guilty over not eating any plants and I think keto should be the desired metabolic state by a majority of people. I treat any cheats I have now as experiments to see how they change my baseline. I know that cheating makes me gain 4-6 pounds for about half a week. On the whole I don’t cheat and stay strict Carnivore all the time. Routine: 2 meals a day Lunch and Dinner. I only drink black coffee, especially redeyes (coffee + espresso), seltzer, water, and rarely diet soda. I almost never drink beer or wine but will have liquor like single malt scotch or vodka. I consider milk no better than sugar water, and I consider fruit juice as worse than soda because it is touted as being healthy. I don’t think we need to eat organ meats, but I’m open to the possibility that they help give us better nutrition. I would like to get to a spot where I can recommend optimum meats in optimum quantities to hit some sort of optimum feeling of best, but I can’t really say what that is yet, I just have an idea of what variables can be tested in the process. Those include omega 3 / omega 6 fat ratios, organ meats, quantity, eating windows, spices, salt, liquids, and coffee. No hunger, effortless intermittent fasting, diminished cravings, iron will. No bloating, indigestion, GERD, constipation. Sometimes loose stool, but usually due to coffee. I do 2-4 hours of intense Brazilian Jiu Jitsu per week. I keep saying I should do some sort of basic bodyweight exercise in the morning (pushups, squats, jumpies, dips) and use it to gain a couple of pounds of muscle, but I don’t lift and I’m not sure if I want to start. I’m tentative about gaining muscle, getting injured, or having to maintain the muscle, and I’m not convinced I must gain more muscle just for benefits of insulin resistance when I have a diet that crushes that into the parking lot. Generally I’ll do BJJ on weekdays 6-8 pm, so I eat lunch at noon and try to keep it a basic meat without a lot of spices(simple cheeseburger) to encourage digestion. I find I feel bad if I have coffee 2-3 hours before BJJ, so I usually have my last cup at 2 pm if I’m planning on rolling (what we call going to BJJ). When I roll, I almost never drink water, and often don’t drink water until I get home, but I sweat a great deal and get absolutely tired. I have really great endurance when I roll, and will use it to exert a lot of control which tires out my opponents, and I think my diet helps me, but it’s hard to say for sure. Generally, I have a feeling of calmness, a quiet fortitude perhaps, that emanates out when my ketones are flowing. I wish I could go back in time to when I was a rower in high school and college and try the carnivore diet then. I think it would be super interesting to see how being fat adapted changes endurance or oxygen requirements. My recovery would probably have improved, my soreness would be reduced, and I’d stay healthier with a better immune system. Instead, I ate a lot of carbs and never considered them a factor to tweak for performance. Use your skepticism to your advantage. There’s more to unlearn in terms of what you already think you know than there is to learn about how the carnivore diet. If you start from a point where you say “I know nothing” and use intuition to work your way forward, you’ll be pretty surprised how un-intuitive a lot of our nutritional advice is. That said, the indoctrination is strong and it will take years for you to realize the full scope of the agenda waged against your health in competition for your wallet. You don’t need to rush into trying this diet, but I think it’s extremely safe, hard to mess up, and ready for prime-time. So start it today and give yourself homework so you can understand it. Read a new non-fiction book you would have never considered reading. Download a PDF on your iPad and read a book during commercials while watching Football. Subscribe to some carnivore or keto themed podcasts and listen during your commute to work. Join the Facebook groups (World Carnivore Tribe, Zeroing In On Health, Principia Carnivora, 100% Carnivore And Beyond), join Twitter and the community of doctors and people who care to discuss health and the #MeatHeals message publicly. Join reddit, read the latest science at r/ketoscience (or beat me to the punch in posting it) and post your experience at r/zerocarb or ask for tips. Follow some hashtags on instagram like #carnivore or #carnivorediet if that’s the only social media network you use. Know that if you put in the homework, you will come away with a deep and nuanced view of what it means to be human, and you will be ready to test whether you are a facultative carnivore. That’s the question I think this diet is trying to answer. Are humans the best they can be when they eat only meat? Right now, it appears this is still very subjective, I’m wondering at what point we say that is true objectively. Overall, I find the evolutionary side of the diet one of the strongest reasons to try a meat only diet – it is hard to imagine us depending on any source of plants in our diet and all too easy to understand that we preferred being facultative carnivores when we had the meat supply intact. Yes, I absolutely believe that Carnivore will be accepted as a mainstream diet – the question is how long does it take. I’m really inspired by the growth of our Facebook group reaching 21,000 in 10 months and having mostly new carnivores, but I think the spate of news articles didn’t really delve deeply enough to show the benefits. It’s going to take some sort of other exposure to get the media coverage the movement needs to get exponential growth. It needs more doctors taking public positions in support of it. It needs some sort of controversial TV event that makes it past the health / biohacking / millennial sphere and into the greater media landscape – but I can say first hand that the Good Morning America exposure I had was not that event. I believe Shawn’s new book The Carnivore Diet could be huge, elevated with some aggressive marketing, and another round of media blitzes. We could suggest some sort of 30 day carnivore challenge that is as popular as the Ice Bucket challenge.. I’m hoping it gets used in science experiments / diet studies but I doubt anything useful will arrive within five years, unless it’s tested for short 3 month stints as a basic elimination diet for people who suffer gastrointestinal issues. I think ‘keto’ has finally hit mainstream and you can get away with saying it and witness some level of awareness. That said, I don’t think most people could name what makes a diet ketogenic beyond restricting carbs in general. I think keto and it’s subgroups, including zero carb will continue to evolve, and there will likely be factions within zero carb as well (strict beef & water or raw only) that will present their best version of health, but the cat is out of the bag and I think we’d be very surprised to hear that any ketogenic diet is unsafe or dangerous in the long run, especially compared to the uncontrolled junk food binge fest we call modern eating. I don’t think I have any particular remarkable story to tell, just that I became convinced by the science and then experienced it for myself. Until you do the same, you just won’t know if you’re a facultative carnivore. I’m not sure I can convince you that you’re one until you add your own vote by trying the diet out yourself, but if you do the homework, you will likely near a conclusion that many of us have arrived at. I’m very approachable on social media. I appreciate interesting content and links and stories of all sorts – so if you have them – share them! I contribute a ton of time to organize links and content, submit well formatted and constructive posts (ketoscience), and always be reading and learning and connecting the dots. 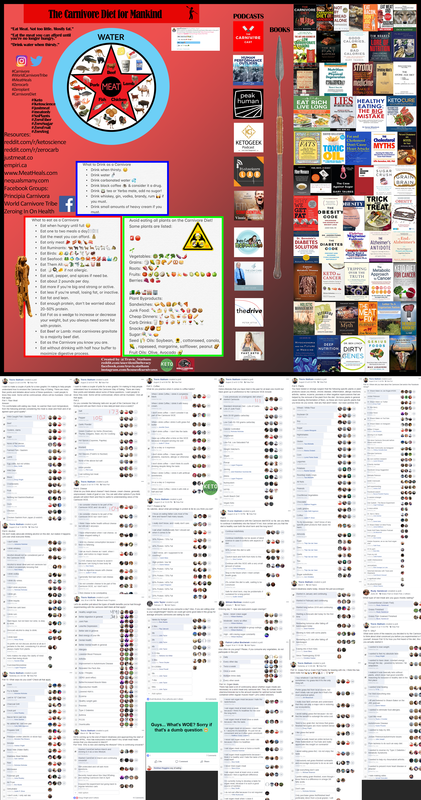 I originally made a star chart of diet advice, then made a chart of books I recommend, then I conducted 15+ polls in WCT and made this gigantic graphic. You have to click to zoom in and pan about – but it has as much carnivore advice as I could fit. I really wanted to get across that we all have different ideas on how we think of the diet and that there isn’t too much consensus once we get past the basics. Obey the basics, experiment until you find your optimal diet. One for HVMN that hasn’t been released, as well as one for On the Bus which hasn’t been released. (KE edit – HVMN is out now). I hoped you enjoyed this interview post. If you haven’t already, check out Travis on Instagram.